Common dolphins are found in almost every ocean in the world. With that being said, there are many ways these dolphins forage for their food. Delphinus delphis live and hunt for food in herds of either a few tens or up to several hundred dolphins. The common dolphin can go to depths of up to 260 meters, but most dives are less than 100 meters (Pusineri, 2007). Not much is known about the diet in the oceanic habitats, but more is known about the neritic areas. In the neritic areas, the common dolphin is the top predator on the food chain. They have three main food groups; the small schooling fish (sardines and anchovies), the fish from deeper layers (sea smelt and lanternfish), and cephalopods which are squids (Neumann, 2001) and (Nino –Torres 2006). These predators will hunt day and night for different foods. During the day, the squids are at a deeper depth, so the common dolphins will feed on the sardine, anchovy, horse mackerel, and cod. During the night, the dolphins will dive deep and catch the squid. About 85% of the diet of the common dolphin is comprised of fish. The diet in oceanic habitats is completely different than the neritic areas (Pusineri, 2007). In the oceanic areas, the dolphins rely on mesopelagic organisms to migrate to the surface at night. Scientists found consistency of lantern fish being in the stomachs of common dolphins. Dolphins will only forage in oceanic or neritic habitats, but not both. Even though there is a lot of information on what common dolphins feed on, not much is known about how the fish are caught. There is a high variability in feeding strategies. It all depends on the habitat, desired prey, and the knowledge of different techniques that allows for the use of certain methods (Neumann, 2001). The most documented method of common dolphins catching prey is when they round up small schooling fish and drive them to the surface where the then cut through the center and eat their prey. This type of foraging often attracts other organisms to get in on the action. Some of these organisms are other dolphins and diving birds. Common dolphins have been observed having interactions with other dolphins. There have been multiple observations of common dolphins interacting with striped dolphins (Stenella coeruleoalba) and Risso’s dolphin (Grampus griseus). About 25% of all common dolphin sightings in the Mediterranean Sea were with other dolphin species. 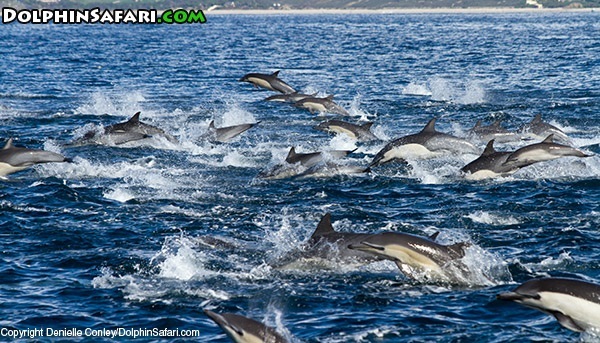 There have been herd of up to 200 striped dolphins and 80 common dolphins together (Frantzis, 2002). Off the coast of California, common dolphins are regularly sighted with sea lions. The sea lions would skyhop and adjust their route to find dolphin pods. Common dolphins and sea lions were observed feeding together at the same time. There was no aggression between them. The dolphins and sea lions would adapt each other’s techniques for finding prey (Berzi, 2006). Common dolphins and humans have had a history of interacting with each other. Dolphin tourism has been a big part of informing people about a need for nature conservation. Some people think that it is bad for the dolphins. They say that the noises of the engines increase the depth time of dolphins. It also changes behavior, eating habits, and disrupting resting activities. Some common dolphins are hunted off the coast of Peru and in the Black sea. Shark nets that keep sharks away from swimmers pose a problem to the common dolphin. They are also caught as by catch in the nets of fishing boats. In one year alone, 15,000 common dolphins were caught in the nets of tuna fisheries (Neumann, 2001).